Color: White Specifications: Product Name: 5 Pieces/Set Newborn Infant Photography Props Baby Posing Beans Bag Baby Pillow Bedding Newborn Positioner Surface Material: Cotton Filling Material: Colors: White Applicable age: Newborns (0-3 Months) Package Included: 5 Piece Newborn Photography Pillows (5 Pieces are different sizes.) Features: * Made of good quality cotton material,supersoft,comfortable and friendly to babies' skin. * Wide enough for newborn baby to change different pose to shoot perfect and memorable photos. * Moon shape design,streamline curve,exquisite and trendy. * Smooth surface,durable and easy to clean. * Ideal helper for newborn babies art photography. Note: Please allow 1-3cm error due to manual measurement and make sure you do not mind before ordering. Please understand that colors may exist chromatic aberration as the different placement of pictures. ✔️Suitable for Newborn Babies. Made of good quality WASHABLE cotton material, super soft, comfortable and friendly to babies' skin. ✔️Perfect Design: 5 Piece posing pillows can be better to help the baby fixed shape. Make your baby become more fashionable, attractive, beautiful. Each posing pillow can also be used alone. 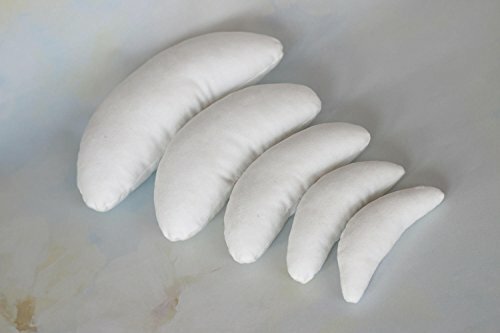 ✔️Wonderful Photography Props: This Crescent posing pillow can help you to shoot all kinds of beautiful classic neonatal posture, it is soft, can support the ends of the baby. ✔️This Crescent Posing Pillow is handmade. Join thousands of happy Newborn Photographers & add it to your cart today! YOU DESERVE TO HAVE IT! If you have any questions about this product by Five Star Photo, contact us by completing and submitting the form below. If you are looking for a specif part number, please include it with your message.